Today is Election Day. And so is tomorrow. And the day after that. By the end of September, voters in 30 states will start casting early or absentee ballots in the presidential race — a fact that both poses challenges for the campaigns seeking to make their final pitches as well as raises the stakes between now and Nov. 6. Absentee ballots have been mailed out in key swing states like North Carolina, Virginia, Wisconsin and New Hampshire. In South Dakota and Idaho — firmly red states — early voting began Friday, and in-person early voting in the crucial swing state of Iowa begins this Thursday. “It’s no longer Election Day; it’s election two months,” said Pete Snyder, the Republican National Committee Victory chairman in Virginia. The campaign ad wars, which used to peak toward the end of October, are expected to reach maximum intensity by the first of the month. Thirty-two states and the District of Columbia allow voters, without any excuse or justification, to cast ballots in person prior to election day, according to the National Conference of State Legislatures. Early voting is often promoted as a convenience for harried citizens. But it may be a bigger boon for candidates, enabling them to deploy money and personnel more efficiently as they work to corral votes as soon as possible. 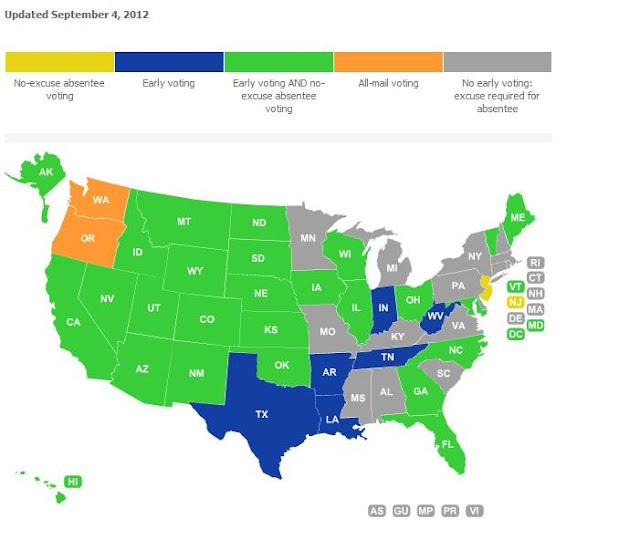 "By encouraging our supporters to vote early, we can focus our resources more efficiently on election day to make sure those less likely to vote get out to the polls," said Adam Fetcher, an Obama campaign spokesman. "We've made early investments in battleground states, where we've been registering folks and keeping an open conversation going with undecided voters for months." Using advanced technology, campaigns track, or "chase," voters who request absentee ballots, often on a daily basis, until they are turned in. Then the campaign moves on. After someone votes early, "You stop sending them mail. You stop calling them. You don't need to knock on their door anymore," said a senior Obama campaign aide, who requested anonymity because he was not an authorized spokesman.